Here at Linking Arts, we’re a woman owned business, and according to this Women’s Business Enterprise National Council (WBENC) Article, our home base of Louisiana is one of the states with the greatest increase in woman owned businesses. We are also a team of designers, creators, and innovators that deliver quality services that deliver for our clients; and we’re not the only ones that think so. We are excited to share that we have been named one of the top digital marketing agencies in New Orleans! This distinction comes courtesy of Clutch, a Washington, D.C. based ratings and reviews platform. 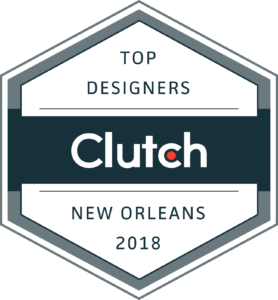 After conducting thorough market research and client interviews for dozens of agencies in New Orleans, Clutch ranked Linking Arts second overall. Not only have we been recognized for our digital marketing efforts, we have also been featured as the number one SEO agency in New Orleans by Clutch’s sister-site, The Manifest. The Manifest is a resource to provide teams with the insight to turn their business challenges into opportunities. We were highlighted for both the overall excellence of our services but also for a notable project we completed for an art and technology startup. To know that our efforts to be partners to our clients instead of just a service provider means the world to us. Check out our Clutch profile to read what else our clients have to say about us. We understand the impact of branding on business which is why we are proud of the services that we provide for our clients. Thank you to our amazing clients, you empower us to follow our passions and we have loved growing with you. We are excited for the future because we know our best work has yet to come.